Tyler Sharpe (15) reacts after a play during the game against UMBC. Fresh off his triple-double against Morehead State on Tuesday night, Horizon League preseason MVP Drew McDonald tallied 21 points and five rebounds to help the Norse past last year’s NCAA Tournament darlings UMBC, 78-60 at BB&T Arena on Friday night. The Cold Spring, Kentucky native finished the game just 10 rebounds shy of LaRon Moore’s (NKU) all-time rebound record of 859, set back in 1997. McDonald will have the chance to break this 21 year old milestone on Tuesday night, when the Norse take on the University of Cincinnati in a regular season matchup for the first time since 1988. Dantez Walton added 19 points (career-high) and shot 9-of-13 from the field for the Norse, with all of his misses coming from beyond the arc (1-of-5). After nursing a groin injury, Jalen Tate returned to the lineup and tallied 10 points and two rebounds in 16 minutes of action. However, with less than two minutes remaining in the game, Tate and Silas Adheke collided and fell to the hardwood floor. Tate began to bleed from his right eye with no apparent blood from Adheke. Both players were able to get up and walk off the court after the incident. 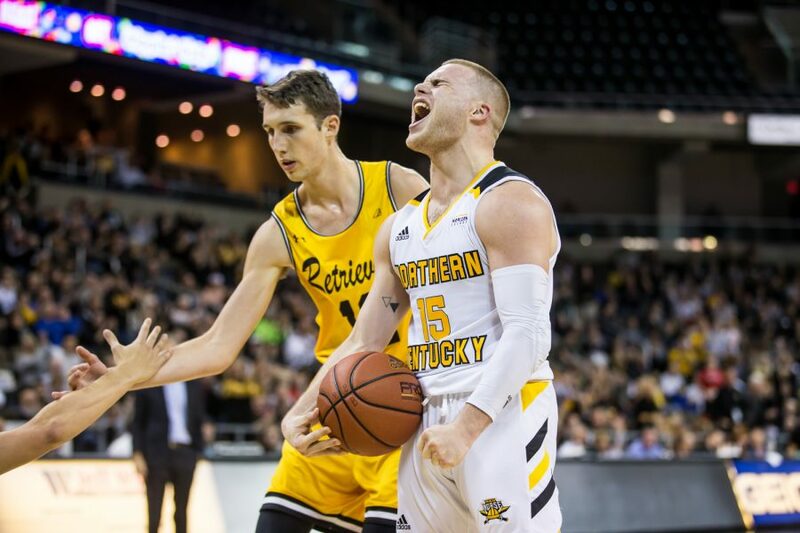 “I checked on them when I was back there [the locker room], and they haven’t given me a diagnosis yet,” NKU head coach John Brannen said. The Norse finished the game 28-of-51(54.9 percent) from the field, while holding the Retrievers to just 18-of-53 (34 percent) shooting and 3-of-23 (13 percent) from three-point range. After allowing nine unanswered points to start the first half, the Norse picked their defense up and shifted the momentum back to their offense after Tate scored the go ahead point (20-19) with a little more than six minutes to go in the half. The team started to find their rhythm after Tyler Sharpe committed the robbery (steal) and made a no look pass to Walton, who finished the layup and added excitement to the BB&T Arena. “I got the deflection and I knew I wasn’t gonna be able to get inside and save it,” Sharpe said. “Luckily me and Dantez were on the same page and he took off running. In addition to his steal and no look pass, Sharpe changed the momentum and finished the game with 14 points, five rebounds and three steals. The Norse finished the half on a 30-2 run and led by 18 points going into the break. Coming back from the half, McDonald nailed a three right out the gate and set the tone for the rest of the half as the Norse led by as many as 30 points to close out the match. The Norse finished the game 13-of-19 (68 percent) from the charity stripe and even broke their their own fast-break point record with 39 points. After the victory, the Norse improve to 8-1 and are now off to their best start in the Division I era. Up next for the Norse, the University of Cincinnati (6-1) on Tuesday, Dec. 4. Tipoff is set for 7p.m. at Fifth Third Arena and will be broadcasted on Fox Sports Ohio.